Rent Little Water Cantina | Corporate Events | Wedding Locations, Event Spaces and Party Venues. Little Water Cantina is a family-run Pacific Northwestern Mexican restaurant. We utilize many local ingredients in combination with Mexican produce to create an innovative cuisine that is both regional and exotic. We have an awesome patio! But it’s not always sunny in Seattle. That’s why we have a cozy lounge complete with a fireplace, TV and a glowing wall of nearly 800 recycled tequila bottles. It’s a great spot to have a party with 30 of your closest friends! Or have a seat at our 24-foot bar top made of two bookended slabs of madrone, above which hang antique gramaphone horns turned into lights. 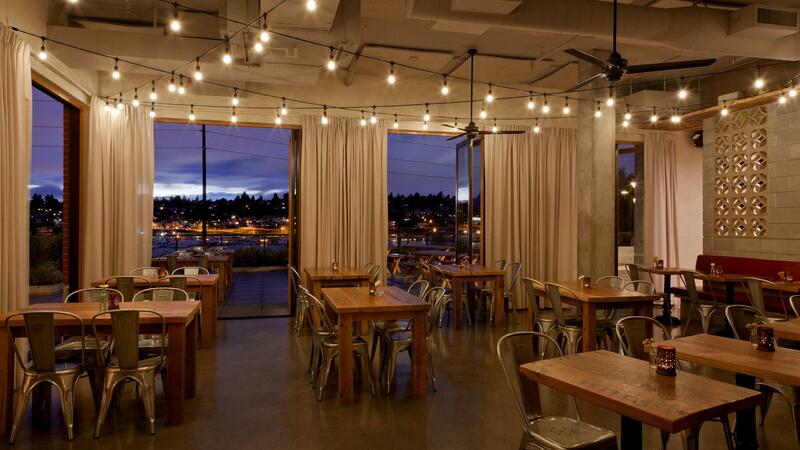 opened on May 5th, 2011 as the first LEED CI Platinum Candidate restaurant project in Washington State. LWC strives to provide a festive, delicious environment in which to pass a few hours with friends and family, and we’re committed to doing so responsibly. We serve local & organic food when feasible, utilize only environmentally friendly cleaning products, and compost all of our food waste. Little Water Cantina believes that valuing its customers, its workers, its neighborhood, and the world at large, makes the tequila taste all that much better! more energy and water than any other small business, costing them 30-40% of their entire operating budget. Through using new technologies in the build out of Little Water Cantina, water use was cut by approximately 70%, and energy use cut almost in half.